SalesForce is a Customer Relationship Management tool that helps you stay on top of every lead, every opportunity, and every interaction. The SalesForce product includes applications for critical areas of your donor management, including basic contact and relationship management, donation processing, queries and reports, and integration with tools such as Outlook, Excel, and QuickBooks. SalesForce is dedicated to helping organizations by providing the tool for free for up to 10 users of any 501(c)(3) organizations. SalesForce.com Foundation is based on a simple idea: Donate 1% of SalesForce.com’s resources to support organizations that are working to make our world a better place. The SalesForce tool is comprised of many useful applications and resources to help you manage your donations and your donors. SalesForce is highly customizable and flexible. SalesForce is a great tool to track all of the interactions you are having with your clients and donors. This tool is highly customizable, which allows you to make it as complex and robust as you wish, but the drawback is that the complexity adds additional time for setup and maintenance. This snapshot shows one of the customization pages. SalesForce is designed for people in the sales industry, so some of the tabs and names are not language that is consistent with the nonprofit industry. However, you can change the names of all the tabs to be appropriate for your organization and the business processes that you have. SalesForce organizes contacts into leads and actual clients. In each category, the information to track is very different and the tool has the flexibility for you to designate fields per your needs. For example, if you are tracking a potential volunteer, you would enter information captured through a screening or application process and you would track that person as a “lead.” For actual volunteers, you may want to track hours participated, special skills, or activities of particular interest. You can flip the designation from lead to actual, when appropriate, without having to reenter any information. SalesForce integrates with many other tools. The SalesForce system integrates with many applications. For instance, if you have a Microsoft Excel spreadsheet of donor contacts, you can upload the information into SalesForce. You can also export any SalesForce data into Microsoft Excel. SalesForce also allows you to create forms in Microsoft Excel for potential donors to fill out that can be easily uploaded into SalesForce. Another great feature of SalesForce is that it can interact with your organization’s website. If you have an online form which allows people to donate money to your organization, the contact information or other questions you ask can be connected to your SalesForce database. The use of this feature does require some basic programming skills. SalesForce has standard reports that you can customize. SalesForce comes with a number of out-of-the-box reports that you can customize to meet your needs. You can also add new reports as needed. For example, you might have a list of potential donors that have expressed interest in your organization, but have not yet donated. You could run a report to identify this list and then send out an email blast or other communication reminding them of your organization’s needs. Or maybe you want to reach out to people who donated last year to extend their generosity into the New Year. These reports assist in evaluating your return on investment to ensure you are doing everything you can to help grow your organization. SalesForce is free for 501(c)(3) organizations, but might require outside consultation for setup. In regards to cost, SalesForce provides ten unique licenses or usernames free, after submission of a 501(c)(3) application. The security of this tool is rated high. In terms of administrative skill, the tool requires the highest skill level rating of five diamonds. This means that the administrator needs to be comfortable using web tools, building websites or setting up an Access database. SalesForce does offer technical assistance and is also able to recommend outside consultants who can help you customize the tool. You can also try to utilize your network of volunteers that might have the skills. For user skill rating, it requires someone who is comfortable posting content to sites such as Facebook or Linkedin, and is also comfortable making purchases online. In terms of key benefits, SalesForce is designed to maintain and track your contacts and donors, and it has mastered this capability by providing flexibility for individual clients to customize the tool for their needs. As for drawbacks, the tool does require some advanced skill and time to set up. This information should be factored into your decision-making process around cost. Although it is free, it may take an outside consultant and extra time before you can begin using the tool. Access the SalesForce website here. QuickBase is a Customer Relationship Management tool that helps you improve your donor pipeline through increased visibility of your data to help you quickly identify important opportunities and risks at every stage in the donor cycle, as well as track progress against goals. The QuickBase tool is designed to provide a variety of functions that can be customized to fit your needs. You can view a list of donors, create a report summarized by the campaign they donated to, or even view a graphical representation of donations. QuickBase empowers your staff to easily access and update information to optimize your donor management relations. Through the tracking of information, QuickBase enables a start to finish centralized location for all interactions. QuickBase has many applications including data and project management. QuickBase is newer to the market and, compared to other tools, it is less expensive because of a small discount for nonprofits, but it is not free like SalesForce. However, QuickBase does have dual capabilities, combining project management and customer relationship management into one tool. In terms of project management, the tool can create work breakdown structures or Gantt charts that figure out what tasks need to be completed over a certain period of time, by whom, how long it will take, and how much it is going to cost. As for data management or customer relationship management, the tool can be customized to adjust the language to fit a donor management process. QuickBase provides standard and customized reports to meet your needs. QuickBase has a dashboard feature that can be adjusted to meet your needs. You can develop highly graphic displays of information, such as number and amount of donations in the given month, which can be emailed out to people or downloaded into Microsoft Excel and manipulated. These features are particularly useful for sharing information with your board of directors, stakeholders, and funders. Report structure can be stored and automatically populated on a weekly or monthly basis and sent directly to your email. This is a great way to stay on top of the outcomes of your program and to be able to track it on a regular basis. Other reports can be created based on goal setting and forecasting. For example, you can evaluate your donor development pipeline by estimating cash inflow from donors or the chance of getting awarded certain grants. These reports can show where you are in your development based on where you would like to be. QuickBase will easily upload your current spreadsheets. Similar to SalesForce, QuickBase allows you to easily upload any Microsoft Excel spreadsheets that you are currently using to keep track of donor information. QuickBase has an additional smart system feature that tries to auto-guess what fields you have within your Microsoft Excel spreadsheet. For example, if the field you have is not a typical address field such as county or region, the tool will create a column for this field that can be changed and manipulated per your specifications. This field can then be used for future data entry. These features make QuickBase easier to set up than SalesForce. Another integration capability similar to what is offered by SalesForce is the ability to create web-based surveys or forms. With this capability, you can easily capture contact information for potential donors online or create a survey to distribute to potential donors. This is done through the creation of a web address that can be sent to anyone or posted on the organization’s website. This feature is slightly easier than SalesForce because no programming is required to get it up and running. The information entered is then automatically entered into your QuickBase database. An additional feature of QuickBase that might be useful in donor management is tracking requests coming into the office. The office staff can directly enter the information into the database and assign it to a staff member with notes and priority level for follow-up. You can then track what requests have come in, whether or not they have been addressed, and how long it took to close the request. QuickBase also has automatic emails and notifications that can be customized per donor information. Similar to when you order an item online and receive an email acknowledging your order, you can send emails acknowledging an online donation. It can include their name or other details they provided, such as the date or donation amounts. A fun way to use this feature is to set up automated emails to staff and donors on their birthdays. This is a nice way to stay connected with little time required. QuickBase has a variety of standard applications available, but costs more than SalesForce. QuickBase for nonprofits costs $225.00 per month which includes ten unique login accounts. Each additional user is $3.00 per month. Since the tool is web-based, two benefits are that there is no software to install and the security rating is high and consistent with SalesForce. In terms of administrative skill, the tool has four diamonds rather than five diamonds, making it slightly easier to set up than SalesForce; however, due to the customization available, you will need a dedicated expert to get you started. The user of the tool should be comfortable posting content and familiar with how to organize a database for consistency. Key benefits and drawbacks are very similar to SalesForce. The tool can easily import and export Microsoft Excel spreadsheets, create custom forms that can be used online for easy data entry, and has customized dashboards for at-a-glance progress tracking. If you do not have predetermined reports, QuickBase has over 250 standardized reports to help you get started quickly. As mentioned, QuickBase does have a robust project management tool at an additional cost, if there is interest in using the same tool for two purposes. Additionally, for support, QuickBase offers free live webinars to learn the features of the tool and a 30-day free trial. Access the QuickBase website here. eTapestry is a donor management system that includes website integration, online giving page creation, and specialized email tools. The tool provides affordable, flexible, and integrated software that is secure. eTapestry has been implemented by more than 5,000 nonprofit organizations around the world because of its quality data management structure; however, they have expanded to include additional services such as website development, ecommerce, and advanced email and donor loyalty studies to help you build stronger donor relationships. eTapestry is donor tracking software that is targeted to small and mid-sized nonprofits. eTapestry tracks donors and prospects while managing gifts, pledges, and payments. The application is built with the goal of significantly reducing the time and effort required for each task while fostering donors. Similar to the other tools reviewed, it is software that runs over the Internet. This is very helpful as improvements to the tool typically happen on a continuous basis and are automatically and immediately available. Data is securely stored, automatically backed up and maintained offsite, and accessible to you 24 hours a day, seven days a week. The tool is very much “out-of-the-box.” It provides a defined set of features that cover a number of common needs, without the need for technical skills or substantial setup. The application provides a set of functionality that works “as-is," but you may run into limitations as you try to address more atypical needs. A unique feature that eTapestry provides is a needs assessment survey that is a great first step to identifying your organization's database, communication, website, and ecommerce needs, and therefore helping to determine if eTapestry is a good tool for meeting those needs. Take the eTapestry Needs Assessment here. Reporting in eTapestry is done easily through flexible report writing functions. The tool provides robust query and reporting functions that include a wide range of standard reports, as well as a flexible report writer function for creating custom reports and exports to Microsoft Excel or Word. All fields within the tools can be queried, reported on, or exported. As reports are developed, each section can be drilled down to more specific subtotals, and as queries are built they can be reused, combined, or added to and subtracted from. The reports created within these tools can help you stay strategically focused on building relationships and maintaining donor loyalty. If you decide to use eTapestry, the company provides a checklist to ensure you have imported your current data into the tool successfully. Conversion Evaluation Checklist. Communication through eTapestry is sophisticated, but comes at an additional cost. eTapestry has created a form that tracks essential donor information such as relationships with other donors or staff members, how they became donors, contact information, and giving summary. It also allows you to track interactions with the donors by keeping detailed notes about the communications in a journal. Communications can be integrated into Outlook and recorded in the journal for future reference. Future meetings or communications that you would like to have with your donors can be set up in Outlook and synchronized with the eTapestry calendar. The tool also provides the functionality to send mass emails out to donors. The company does provide an Advanced Email module, at a cost, that expands the capabilities of the standard mass email by including an HTML editor to build graphic emails, scheduled delivery options, reports on deliverability results, views and opens, and blacklist monitoring to ensure maximum delivery. This is ideal for organizations looking to expand their email marketing activities. eTapestry is a secure environment for your donor information. eTapestry has a flexible price schedule to accommodate varying budgets and sizes of organizations. Additionally, they give the tool free to nonprofits with one user and with fewer than 500 donor records. For 1,000 to 5,000 records and two users, the cost is $162 a month. You should check pricing carefully as the cost does increase fairly rapidly as more donor records are added. Additional features, such as advanced customer support, also involve additional costs. If you decide to use eTapestry, you can choose quarterly or annual payments to ease cash flow burdens, or add tools and services on an as-needed basis. As for security, customers' data is securely kept in a safe housing environment maintained by a third party specializing in Internet security that uses an encryption method similar to Internet stock brokerage and Internet banking systems. Data is backed up daily and tested. Any access to your data for support reasons is done only with your approval. Administrative skills require someone who is comfortable using web tools or building websites, whereas the user only needs to be comfortable posting content to sites such as Facebook or MySpace. Overall, eTapestry does a few things very well, including providing the full picture of the donor relationship, email blast capabilities, and online payment processing. It is very easy to set up, but may not meet your needs if you want a system that can be highly customized beyond what is initially provided. Access the eTapestry website here. Before implementing a tool, you’ll need to identify and understand the needs of the people who will use it. These people include your volunteers or partners. Also identify anyone else who is going to be impacted by your decision, such as the consultants, clients, or even the board of directors. These people are your key stakeholders. Once you’ve identified your needs, take the time to compare the features that meet those needs. You can begin by using the comparison table and report card provided. Build upon these tools and adjust them for your organization. Determine if you can get a free “test drive” of the product. Ask end users to be involved. Their involvement will result in highly applicable feedback. Additionally, you will be able to rely on them to help train the rest of the team or speak about their positive experiences with the tool. Once a tool is chosen and the adoption phase begins, you will need to involve key stakeholders in the beginning to help manage the change. Many players are involved, so you must identify and mitigate possible risks, including refusal to adopt the tool, or volunteers and partners not showing up. Evaluating risk includes identifying the likelihood of an event occurring and the resulting negative impact. Next, think about how to communicate the decision to implement a new technology and how to get people involved. What are you going to say to your stakeholders? Is it going to be in a series of emails, in a meeting, or in a newsletter? Finally, who is going to be rolling this out, and who can answer questions? This is where your end-user pilot advocates will come into play. Also, you can identify people whom you believe will be early adopters to have them be part of the rollout plan. Thank you for taking the time to view this tutorial on Data Management. These tools streamline the data management process by integrating all the necessary information and steps into an efficient process for you and your staff. Work with your staff and take the time to research which tool is best for you so you can build a strong donor database and grow your organization. These online tools are useful for managing your donors and their donations. Thank you for taking the time to watch this tutorial. All of the tools reviewed were selected because they are low-cost or even free for 501(c)(3) organizations, web-based, require little or no programming and advanced technical skill, and fit the needs of many organizations. Here’s a summary of the tools reviewed. SalesForce: Free for 501(c)(3) organizations, but might require some additional advanced skill for setup. 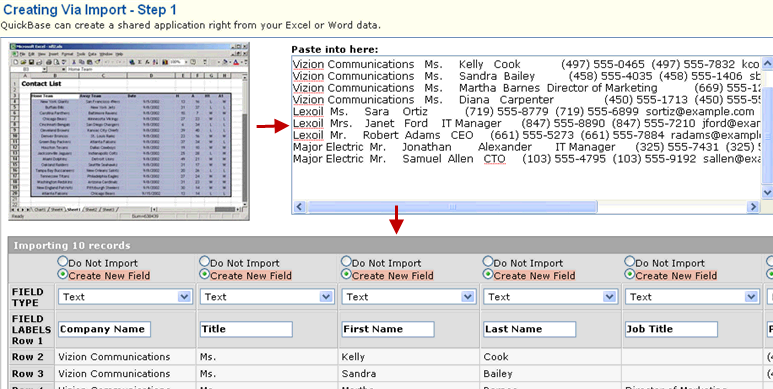 QuickBase: Can easily import and export Microsoft Excel spreadsheets and create custom online forms. It has more than 250 standardized reports to help you get started quickly. eTapestry: Has high security and is very easy to set up, but is not as flexible as the other tools to meet custom needs.